Dominio de Antargu is a modern restaurant offering Spanish cuisine. The average price of a main course dish at the Dominio de Antargu restaurant is 20 euros. The average price of a 3-course meal at the Dominio de Antargu restaurant is 50 euros. Note that although GoMadrid.com strives to maintain all information about Dominio de Antargu up to date, the prices mentioned are only an indication and may not reflect the exact value of your meal. A temple for wine connoisseurs, we can enjoy in this restaurant a substantial selection of the best wines available, classical as well as the trendiest, with an open cellar that stocks over 10,000 bottles. Unfussy Mediterranean based cooking with an emphasis on the quality of the product; it's worth trying their fish and vegetarian options or for the carnivorous go for the sirloin steak, cooked to perfection. 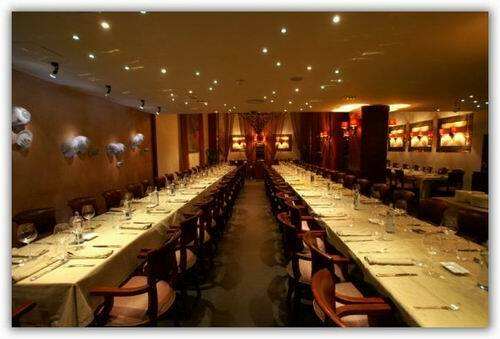 The address of the Dominio de Antargu restaurant is: Ronda de Atocha, 16, 28012 Madrid. The nearest Metro station is Atocha. Please see the Dominio de Antargu restaurant location map below.